Our FDC 3/4 ton truck and a trailer, seen two pictures back, carried all our FDC equipment when we changed firebases. Our radios mounted in the 2 rectangles just behind the seat and were powered by the truck battery. Maintaining radio contact was the most critical work of Fire Direction Control (FDC) while our battery was on the move. If ambushed we needed help FAST because our howitzers needed to be organized properly to effectively defend ourselves and we also had no communication between FDC and the gun crews. We were vulnerable even armed with howitzers and M-16’s. We constructed Fire Support Base (FSB) Buell 3 with orders to construct a model firebase to show visiting VIP’s. 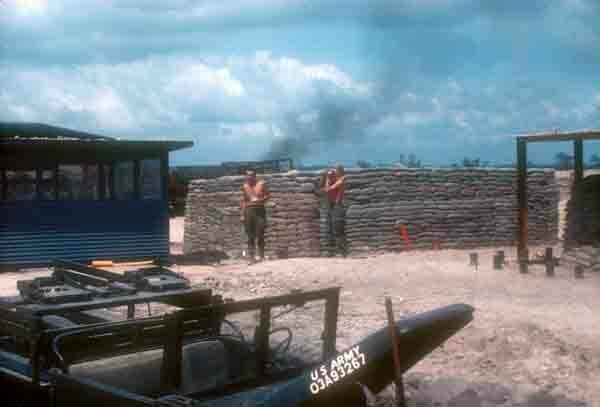 This image shows our good work but shortly after our first VIP visitor (a VFW official) we moved to the most isolated and primitive base we ever occupied. Goodbye good life.